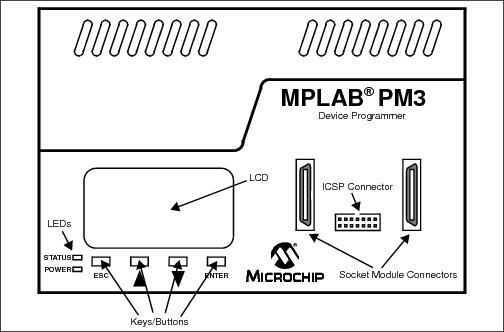 Follow the steps below to set up MPLAB® PM3 hardware for programming. MPLAB PM3 provides communications with the host PC via a USB connector or an RS-232 9-pin D type connector (see figure). Connect one end of the USB cable to a USB port on your PC and the other end to the USB port on the back of the MPLAB PM3. A “New Hardware Detected” notice should appears on your PC. Follow any directions on installing the proper driver or your MPLAB PM3 will not work. IMPORTANT: Set the COM port FIFO buffers off, the Flow Control to “Hardware” and Baud Rate to 57600. You will need to reboot your PC for these settings to take effect. Connect one end of the RS-232 cable to an available COM port on your PC and the other end to the serial port on the back of the MPLAB PM3. Make sure that the power switch on the back of the programmer is in the “O” (OFF) position. Plug the power supply into a power socket and connect the power supply cable to the unit. To power the MPLAB PM3, toggle the power switch on the side of the MPLAB PM3 to “l” (ON). MPLAB PM3 automatically performs a self-test ensuring the programmer is functional. No calibration is required. Plug your socket module into the socket module connectors on the top of the MPLAB PM3 (see figure). To determine the correct socket module for your device, refer to the Development Tools Selector (DTS) located on the Microchip web site. Once you have determined the correct one, select and purchase your socket module from microchipDirect.